President Samuel L. Stanley Jr. traveled to Washington D.C. this week to accept the Senator Paul Simon Award for Campus Internationalization on behalf of Stony Brook University. The award from NAFSA: Association of International Educators recognizes outstanding accomplishments in international education. On Tuesday, Nov. 13, Stanley sat on a panel with presidents from three other Simon Award-winning colleges and universities to discuss study abroad programs, international students and more. The panelists went on to discuss some of the lessons they learned that other educators could benefit from. The panel also took several questions from the audience. One woman asked the panelists to share some specific challenges their schools faced in regards to immigration. Harper College President, Kenneth Ender, said his school has struggled to address issues related to the Deferred Action for Childhood Arrivals (DACA) program, which gives undocumented immigrants who came to the U.S. as young children protected status to live, work and attend school here. When the Trump administration rescinded the program last year, it left DACA recipients at Ender’s school feeling vulnerable. “How [do we] support students that are with us and living day to day around the question of ‘how long am I going to be here?’ and ‘am I safe to be identified on this campus?’” he said. 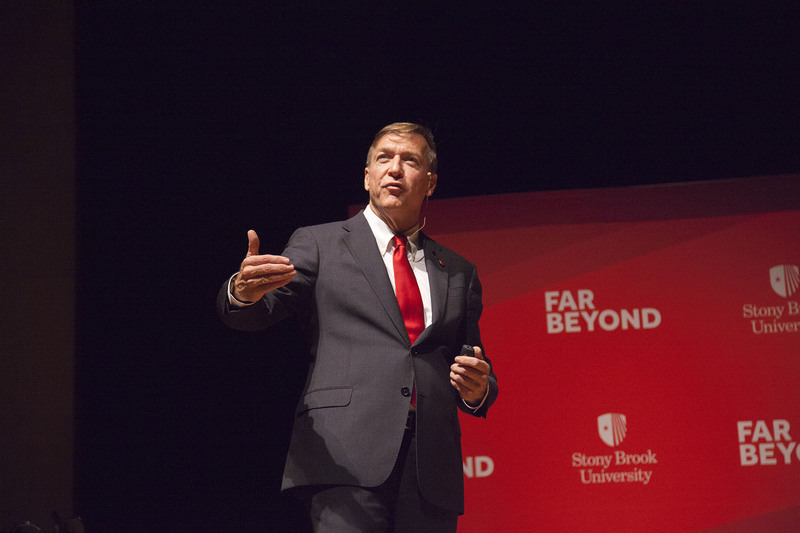 He noted that as international student enrollment in the U.S. has started to decline, it has become more difficult to spread the message that Stony Brook is accepting of students from all backgrounds. The Senator Paul Simon Award for Campus Internationalization is named after the late Illinois lawmaker who was “a lifelong advocate for international education and exchange,” according to the NAFSA website.